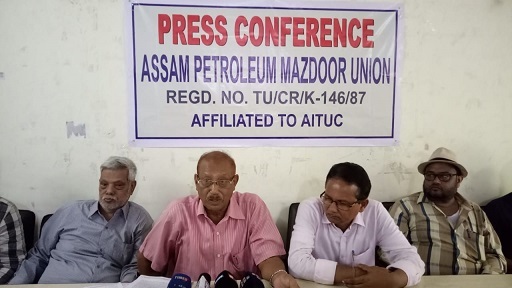 The Assam Petroleum Mazdoor Union (APMU) on Friday announced to relaunch an indefinite agitation against the alleged oil syndicate in Digboi OIL terminal from August 27. Mahanta alleged the Digboi OIL terminal authority is also involved in oil syndicate that is being carried out for a long time. Lashing out the BJP-led government’s ‘zero tolerance policy’ against corruption, the APMU president alleged that the Digboi OIL terminal authority, Tinsukia police, Dibrugarh MLA, Digboi MLA and Margherita MLA – all are involved in the syndicate. The APMU president also informed that the workers would go on strike in all 17 loading and unloading points of fuel in Assam from August 27. “There may be fuel and gas scarcity across the northeastern states. The BJP-led Assam government would be responsible for such possible scarcity,” Mahanta said. The union also demanded the government to implement the minimum wage policy for the workers of OIL terminal. The union demanded immediate and necessary action from the authority concerned and the state government at the Digboi OIL terminal to stop the ‘oil syndicate’. It may be mentioned that the union launched the agitation on August 13 last, but withdrew the agitation on August 15 to show respect toward the Independence Day celebration and the demise of former Prime Minister Atal Bihari Vajpayee.